You can attract a specific person with the Law of Attraction for love. The one you love is the most important person to you, and there's no reason why you have to give up hope. With the Law of Attraction, you create every aspect of your reality…including attracting a specific person, healing a relationship when things look impossible, and having an ex come back into your life. It doesn't matter what your situation is like. It can get better. This article if for everyone who has questions about using the Law of Attraction for the love of a specific person, but is afraid to ask. Keep reading to find out how to manifest the love you want. To manifest a specific person, the Law of Attraction for Love works by focusing on you. It isn't about the other person. It's about you. So how do you focus on yourself so that the Law of Attraction can bring you a specific person? Manifesting a relationship with someone is easier than you might think. Once you get past any feelings of loneliness, heartache, or any limiting beliefs, the process is quite simple and fast. I'll outline it here and go into detail below so it all makes sense. Be willing to let the other person go – a key step that isn't what you think! 1. Be confident in yourself. Realize the great person that you are and that it doesn't matter what others think about you. You don't have to make someone else like you or love you because you already love yourself. Self-confidence is irresistible and will attract people to you. 4. Have fun. People are most attracted to smiles and laughter. When you're having a good time, others notice and want to be with you. So do the things that make you happy…whether it's watching a funny movie or going to your favorite park to eat lunch. Enjoy your life. The more fun and joy you have, the faster you can attract a specific person. 6. Appreciate the contrast. Be happy for what you have. Forget about the things that you are wanting. Once you can be happy in the moment, the things you want will start falling in place, including your love life. 7. Be willing to let the other person go. This is one of the hardest parts of the Law of Attraction for love when attracting a specific person. You know you want to be with him/her, but now you’re being told you need to be willing to lose them. Crazy, right? But whatever you decide to do, focus on doing what makes you happy. Don’t worry about how things are with your specific person all the time. Worry about yourself. Pamper yourself. Take care of yourself Let him/her see what they’re missing. The Law of Attraction will bring you the love you want. Get my proven step-by-step system for using the Law of Attraction for love to attract a specific person with my book: Manifesting Love: How to Use the Law of Attraction to Attract a Specific Person, Get Your Ex Back, and Have the Relationship of Your Dreams. Good ideas! I really like 1-5. Whenever I’ve wanted to get someone back, I’ve gone out dancing with friends and flirted with all the cute guys. In no time, we’ve gotten back together. It works every time! That’s great Mary! I’m glad you’ve had so much success using the Law of Attraction for a specific person! Having fun and enjoying yourself works wonders. Keep up the good work! To be successful using the Law of Attraction for a specific person, you need to stop running after him and start focusing on yourself. Do things that make you happy. This will draw him to you faster than what you’re doing now. I was in a relationship wid a guy for 6 long years. We both loved each other a lot. Bt then due to family pressure, he had to get engaged to some other gal. We both were unhappy wid it but there was no way out of this prblm. I still love him & want him back but he says he cant come back now…so I shud forget him & move on in life. How do I attract him back?? Visualization and focus are part of the Law of Attraction, but you still have to take specific action, be open to receiving, etc. If you go through this site, you’ll find all of the elements and instructions on how to use them. I highlighted several articles already in the comments above. The basic funda remains same… ASK, BELIEVE and RECEIVE. .. now that you have asked for some one specific, you need to believe that you will get the one you desire. If you have Believed it than ENJOY the feeling of RECEIVING your love. and Be happy that you have received it. .. you will surely get it as LOA says… Your wish is my command. You will get it. This is what DESIRE is about. This status of yours sends a signal to the universe that you have complete believe in this energy. If in case you get into DESPERATION than it indicates that you have DOUBTS in the system.. will i get him/her or not !! and if you have doubts that will you get her/him or not… .LOA says.. your wish is my command… so you create more of doubts. So just believe… you will get what ever you desire. I have a friend who I was just more than friends with, and we really liked each other. We talked to each other everyday, even if it was to see how each other are. A girl that we both know has caused a rift between us. She was seperated from her husband for a year and a half, and she used to flirt with him. Now she is back with her husband she is still flirting with him and I think he has taken a liking to her more than me. Thanks Frances! Your comment was a really pleasant surprise. I’m glad my book has helped you. Keep believing and you’ll succeed at using the Law of Attraction to attract the specific person you love. Let me know how it goes! It’s all the same when using the Law of Attraction to attract a specific person. You can get anything in your life. With belief, all things are possible. Follow the steps in this article and they’ll help you to be with her. What you think, you create. If you think you’re doing something wrong, you can prevent the Law of Attraction from bringing you what you truly desire. If you think the Law of Attraction isn’t working to bring you the specific person you love, you will create signs of it not working. All i want you to ask yourself is one thing…. Are u actually feeling it ?? Alot of people do apply the LOA, but its like they are forcing it. So the fact that you are having doubts and saying “This stuff doesnt work,the universe says – Your Wish is my Command”. I can’t thank you enough for your response! It really brought my vibration up so high when I first read it… and it continues to. I have faith. Thank you again. I’m so glad I could help PM! For example, you wrote “Now, she hardly talks to me. Things are getting worse day by day.” Statements like that, create more experiences like that. Trying changing it to “Now, she regularly talks to me. Things are getting better day by day.” Something as simple as this can change what you’re creating and your world will change with it. Hi SKA, I provide a list of steps to take in my book, Manifesting Love: How to Use the Law of Attraction to Attract a Specific Person, Get Your Ex Back, and Have the Relationship of Your Dreams. It’s far too much to explain here. You might find the articles mentioned above helpful in shifting your vibration. Why can I not purchase a copy of your ebook for kindle? Is this because I am in uk? I love the articles by the way. Thank you. Thamk you for your email. I have managed to purchase it and put it inyo practice. Can I ask how effective it is. The Law of Attraction works every time. The effectiveness depends on you and the energy flow you put into manifesting your specific person. The more positively you flow energy in relation to your desire, and the more you sustain that energy, the faster you will see the results you want. Let your emotions help guide you along the way. You always decide what you will manifest with how you flow your energy, so make sure your energy is flowing to bring you what you want, not what you don’t want. Thank goodness someone real! Thank you so much for your email and help. Yout book is great. Feeling liberated and as if worry has disappeared is wonderful! That’s a sign that you’ve tapped into heart energy. It naturally raises your vibration and releases resistance. You’ve made great progress in using the Law of Attraction for love to bring you your specific person! I want to buy a copy of \’Manifesting love\’. How can i have it? Thank you very much for the wonderful LOA resources, books, Advice, and presence! You are a beautiful ball of energy & light! I feel as if im doing this all wrong–primarily because I dont see it manifesting. Ive poured over your book and site and I am at a loss as to my missteps….am I still stuck in resistance or not allowing? i want to increase my height..what do i do for tha.plz help me..
My situation is very similar to this… My guy was always telling that I would be better off with someone else and that he couldnt’ give me everything I deserved. What are your thoughts on this situation and how to change it Elizabeth? Thank you! So what do you suggest I do instead? I never thought of it as trying to control it-I thought it was inspired action because it was so out of my norm. Right now I am heartbroken and my faith is very shaken….I believed I was sending the pos vibes and intentions out there-i really felt as if….now I feel lost and defeated. So should I focus on centering myself again, aligning my chakras, & only after that then start acting as if and focusing my attentions again on the relationship I want to create with my ex? You need to let go, release all resistance, and allow it to happen. Trust that the relationship already exists and allow yourself to receive it. Focus on feeling good. Hi Onique – When you know why you’ve attracted the relationships you have attracted for the last 10+ years, you will know how to attract a positive family oriented relationship. Responsibility for one’s reality rests with oneself. Reality is an illustration of the choices one makes. These choices are a mixture of thoughts, beliefs, and feelings. Hi, I am from India. I wanted to know whether your book is available in physical copy. I donot have a kindle. So if i buy it from amazon, how will i be able to access it. I donot to know much abut kindles. Pls help. Thankyou. Hi Riddhi – My books are only available in India as kindle books. You don’t need a kindle to read them. Amazon has free software you can download that allows you to read it on your computer and other devices. 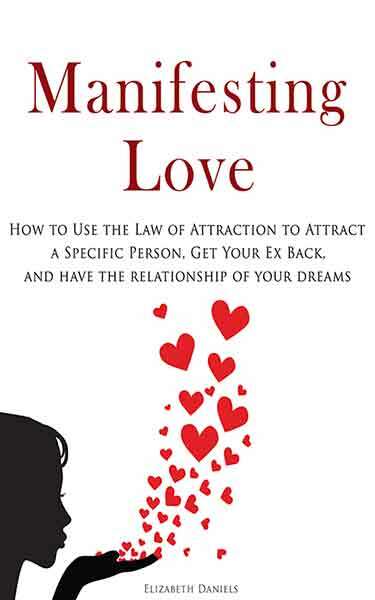 It’s super easy to read my book on using the Law of Attraction for love of a specific person! Using the Law of Attraction includes letting go and focusing on your blessings. They aren’t separate things. In order to succeed with the Law of Attraction, you have to work on your thoughts, beliefs and emotions AND let go and appreciate everything in your life. Hi Elizabeth, I would like to purchase your book ASAP but I am from Singapore. I can’t seem to use amazon to purchase your book what do I do? And I don’t have kindle so how? I want to use your book to know how to shift my focus because I keep focusing on the negative aspects. I hope to hear from u soon. Hi Rekha – My books are only available in Singapore as kindle books. You don’t need a kindle to read them. Amazon has free software you can download that allows you to read it on your computer and other devices. It’s super easy to read all my books, whether you want to manifest money or use the Law of Attraction for a specific person. can you give quick tips on increasing belief? Hi Riddhi – Belief and faith are necessary in order to assume the mindset of having it. Lack of belief often stems from resistance. Overcome the resistance and belief increases. I like a Girl. in My office..specifically .. we are stranger as she is a new Joinee. Recently we started talking with each other Just a hello. ( but out side the office).at the Station or on the Road. while walking . I am confused what should i do . You don’t have to limit yourself to one person. You can pick the best person for you. You can use the techniques in my book on the law of attraction for love to help you do this by focusing on the type of person you want, as opposed to the specific person. PS: My girls and I have Elizabeth “book club” and “posts clubs” now where we go through your books and articles and motivate each other. You are a good person Elizabeth. Helping others reach their goals and through difficult times is an amazing and honorable way to leave a mark in this world. Thanks!!! Hi Lynn – I’m glad my book on using the Law of Attraction to attract a specific person into your life has been able to help you so much! I never imagined anyone would be having a book club or post clubs. 🙂 That’s so cool! Also, a specific date can also delay a manifestation at times. People can focus on a date so intensely that they delay an invent from manifesting until the date. For example, picking Christmas could delay something from manifesting until Christmas, whereas if no date had been picked it may have manifested months earlier at Halloween. So you can use Christmas, but be aware of any fears or other forms of resistance that comes up if you do. She can continue with her Buddhist mantras. It won’t interfere with anything. Hi Maria – The following article should help you better understand letting go to attract a specific person with the Law of Attraction for love: Are You Having Trouble Letting Go? It’s okay if he sees you. If seeing him makes it difficult for you, change it so you can’t see him. Do what’s best for you when attracting your specific person. The Law of Attraction for love has your best interest at heart. I believe in the LOA as it has worked for me my entire life in many situations that seemed absolute hopeless. But i have not used it for a specific person ever, but I am so excited to do that now. My question is, is there another format where I can get your book, as I do not have kindle? maybe print format or download? I will pay the same price of course. Thank you! Hi Yana – You don’t need a kindle. Amazon has free apps that allow you to read it on your computer, ipad and other devices. 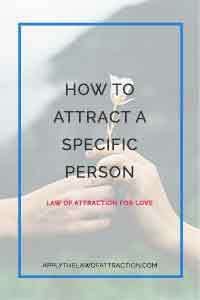 It’s super easy to read my book on attracting a specific person into your life using the Law of Attraction. Hi Missy – It doesn’t matter if you know he’s the one or not. If you just want to “give him a try” so to speak, you can do that too. If you’re not comfortable focusing on him specifically, then just focus on a general person. You’ll have better results if you do what feels right to you. Thanks! I have not heard from him in a while. Should I contact him or just wait? I know you are supposed to take steps towards your goal and just not sure if me contacting him is a step or a sign that I don’t trust the process. Please advise. Please reread Chapter 10 and follow the advice in it for attracting a specific person. as per neville goddard e should imagine a scene which reflects fullfiment of a ish..like a friend congratulating u on your promotion..can u give example for fullfilment of relationship with specific person..considering i live in india were we do not stay together pre-marriage. Hi Riddhi – I’ve answered your question about Neville twice previously. Please refer to those answers. 1) Stop focusing on the negative. Focus on what you want to create. Change how you view your ex. Allow yourself to see him as being nicer towards you. Focus on what you like about him. 2) Remember that your thoughts create. If you believe manifesting him is very challenging, it will be for you. You need to overcome the negative feelings you have. Choose to be happy and do things that make you happy. It will get easier. hey Elizabeth pls also do tell me how to make or subconscious mind to work and manifest him in my life…….and steps to receive commitment….and what if he doesn’t love m anymore still can I achieve his commitment…..pls do reply I really need or help I really love him…. I can’t believe how much help and advise you give people. You really make good use of your time. All I can say is God bless you! You deserve everything! At the same time, hoping you can please help me 🙂 ? I really really like this girl who recently got married to someone else (deservedly to a great guy). But she and I get along really well. She is amazing. Obviously I cant go down the path to attract her using LOA. That’s just plain wrong. But I can’t help it. I like her. I see your advise about loving myself/ being confident/ being fulfilled/ keeping happy. It all makes sense. I think I do do that. In fact I’d say I’m pretty confident. Sometimes overly. Sometimes I have an ego too. Have to be honest and admit it. Is there anything I can do using LOA to help me out? Any advise is appreciated to the utmost. 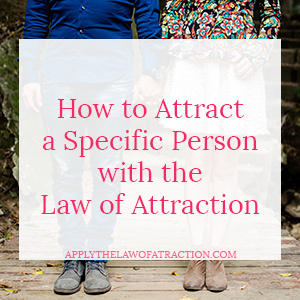 Why not use the Law of Attraction to attract another girl, someone you’re interested in? It’s okay that you don’t like the same girls your friends do. Manifest someone who strikes your fancy and makes you happy. Thank you Elizabeth! Wish me luck! Ayesha – Don’t just read this article. Apply it. It’s clear from every comment you post that you are not applying any of the tips in this article. Change begins with you. 3) Last but not least, could I start by manifesting nice emails from him first? Just something small? As he never contacts me first for anything anymore. Would that be alright to just manifest him little by little to build my confidence? I know you have so many mails to answer and I understand if you don’t have the time to answer mine but I am looking forward to reading your answer because I am confused but eager to move on being positive! Hi Siobhan – You’ll find a lot of the answers to your questions in the book and in this article: How I Manifested a Specific Person with Law of Attraction. If you need more information on letting of of the outcome, these articles might help: Are You Having Trouble Letting Go? and 4 Great Ways to Overcome Resistance in Law of Attraction. You can start with manifesting nice emails if that’s easier. Start with what you’re comfortable with and work your way up. Starting small can help you overcome resistance, especially if you have doubts that it’s possible to create the relationship you want. This is really working.thank you for advise.just learnt that it all begins with me. Thank you for offering good advice and sharing your beliefs. I believe that I have a special connection to someone and he shares that feeling, but broke up with me because he does not feel he is’ in love’ with me, though I interpreted his signs as such. I believe I manifested him into my life and we get along fabulously. If he doesn’t want to manifest me to stay in his life through his beliefs, how can my ‘law of attraction’ manifest, if he isn’t a willing participant and does not feel the same way. Wouldn’t his ‘law of attraction’ beliefs clash with mine? Who’s to say I have more manifestation power to override what he wants or feels? Hope this makes sense. This has a lot to do with quantum physics and is far too complex to give a detailed answer here. Basically, you create your reality. Everything in your reality now is based on what you have created in the past. Your future is based on what you are creating now. Manifesting is about lining up with the reality you want. A future exists where you are with him and a future exists where you are not with him. You simply have to come into alignment with the reality that you want. All the power lines in you. Thank you for your answer and this makes sense. I understand that if my reality is to have him in my life, then he will be. If his reality, is to not have me in his life, then I won’t be. So which reality ‘wins’ in the end? You will experience the reality you are most in vibrational reality with. It’s about you, not him. You create your reality. He doesn’t create yours. If you’re in alignment with him being in your life, he will be. Hi dear Elizabeth .I know it may sound weird but is it possible to attract so who is married now? I know how it sounds but he’s married unhappily and is going on just cos of traditions,if u know what I mean? Even I have the same question as Mary. And I do believe that it is possible. Please advise. Anjali – Elizabeth explains how to use the law of attraction to attract a specific person in her book, Manifesting Love. I like a Girl in my office…. we are friends now. But i want to take our friendship to another level..some times she smiles at me some times she ignores me..i am confused can you please advise me. when ever she ignores me i am always Negative thoughts abt our friendship. If you want to take things to another level, why not try asking her out? He even said he didn’t tell out roommate, who is his best friend and tells everything to, because he knows he would tell his girlfriend who would tell me. “That’s how big this is,” was his words. Elizabeth, please help me understand everything that is happening and how I can think less and be stressed and manifest this relationship with him, keep him in my life forever, and attract a marriage. Ive been thinking of ignoring him and maybe that will help him miss me but I not sure..how can I apply your book to this situation because I already have him just not the way I want. LOA says when creating our reality we shouldn’t be incoherent about what we desire and asked for. My question is, if I’m trying to manifest my ex, isn’t it incoherent to date and make plans with someone else? I’ve read a lot from people successfully getting their exe’s back by letting go and going for a new relationship, but I’m not sure if I’m blocking my ex when I’m excited and happy about a new person. Adrina – Elizabeth explains how to use the law of attraction to attract a specific person and create the relationship of your dreams in her book, Manifesting Love. And sorry for my lines structures. My english line construction is not good. Kamal – Elizabeth explains how to use the law of attraction for love and to attract a specific person in her book, Manifesting Love. Hi Elizabeth, I would love to read your book but I don’t have a kindle. Is there anywhere in Australia that I can purchase the book as a hard copy? Or download it online to read from my computer? Thank you so much. Hi Hazel – You don’t need a Kindle. Amazon offers free reading apps to read it on computers, tablets, smartphones and more. You can find the free apps here. It is available in Australia here. And thank you so much!!!! 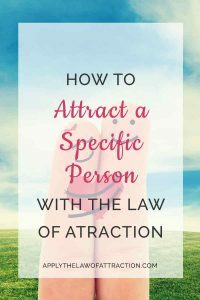 Tracy – Elizabeth goes into detail on how to use the law of attraction to attract a specific person in her book, Manifesting Love. Oh my God, you’re so right! I did exactly what you did and it caused me all sorts of problems. His ex doesn’t matter at all. You gotta check out Elizabeth’s book! It’s the bomb for changing how you think and using LOA for a specific person. Me and my boyfriend love each other since 6 years. Now I am abroad for my study and his parents marry him with a girl that they choose because of religion. After 2months of he married he contact me. i am so happy. i want him back. I use the Law of Attrantion to get him back. How to manifest it. Juli – Elizabeth explains in detail how to use the law of attraction to attract a specific person in her book, Manifesting Love. Susan – Elizabeth explains right below where you post that she can no longer respond to individual comments. You might want to check out her book, Manifesting Love. It explains in detail how to create the love relationship you want with a specific person, using the law of attraction. I think it could help you in your situation. is there anything i can do????? I’m not sure why you received that message. I checked Amazon and it is available for purchase. It may have been a temporary issue with their recent site updates. You might want to try again. Tra – Elizabeth explains right below where you post that she can no longer respond to individual comments. You might want to check out her book, Manifesting Love. It explains in detail how to create the love relationship you want with a specific person, using the law of attraction. I completely believe that you attract whatever and whoever you want. 2 years ago I saw a girl in a nightclub website…she was the dj. I was in another country in that time and was coming to America, to the same city as she was. I thought about her, but not that much…but I had the feeling that in some point I was going to meet her. I came to USA, I met another girl, and “forgot” about this dream girl, but on weekends I tried to go to see her djing but something always happened. I have troubles with my girlfriend and one night I decided to go out to dance, alone. And guess what: the dream girl was there djing. I met her one year later. I left the night club with the feeling that We were already in a relationship…and I knew she had a boyfriend. from that time (August) until December I was living like we were in a relationship…and I didn,t see her djing anymore. In october I started messaging her on Facebook, asking about musics etc, because I had the feeling I should make a move. In the end of the month she broke up with her boyfriend and I was like “OMG” it is working. She started invite me to go to places where she was djing…and I did. It’s all about feelings and beliefs. Arthemia – Have you read Elizabeth’s book Manifesting Love? It explains in detail how to create the love relationship you want with a specific person, using the law of attraction. It doesn’t matter what’s happened in the past. You can have the relationship you want. Marie – Elizabeth explains how to use the law of attraction to attract a specific person regardless of your circumstances or situation in her book, Manifesting Love. Hi, I know LOA by several months……but only one question is in my mind that should I visualize my desire only one time or repeat until my desire is not fulfilled ? Please reply. I am so relaxed and easy now.your help survived me from a deep depression. Thanks God for organizing this article and this person on my way! Hi, I bought your book, and I was wondering about the vision board. Instead of cutting magazine pictures and stuff like that. What if you drew the things you invisioned instead. I am an artist and I think I would rather do that. Make a big art piece that shows all of what should be on my vision board. what about applying this techniques to get a best friend back? And what if this best friend is also an ex lover? Do you think is possible to restore a friendship with this backround with help of law? I think you could do it. I think I read some reviews on Amazon UK for her book that talked about doing it for a friend. I doubt it matters if it is for a friendship or a romantic relationship. I think you would do the same things. I don’t think Elizabeth answers questions here anymore. She does have a book that explains how to use the law of attraction for a specific person. It’s Manifesting Love. First of all, thank you so much for putting together a great book and website that is of immense help to so many of us all over the globe. I feel extremely grateful to have stumbled upon it while looking for answers to my questions. You are doing a wonderful thing, Elizabeth. God bless you and everyone else involved! I have read your book and have been following most of the things. However, there is one concern I have. The guy I am in love with is a very close friend and we talk every single day at least for a few minutes. He knows how I feel about him and says he thinks of me as just a friend. I think your question can be summed up with one other question: Is he your ex? You might want to reread what the chapter your referring to is about. Great Article! Useful 7 ways for manifesting your soul mate, and yes, it is very hard to do what you suggest in the last point. Not many people are willing to let go of the person they love. Also, we should definitely focus on what makes us happy and not stress out much about all the details. Very useful tips! 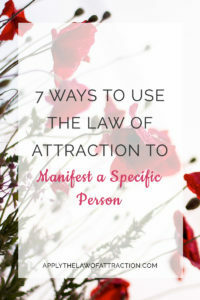 You should read this post https://www.applythelawofattraction.com/manifesting-love/ It answers your question. Hey , my elementary crush just came back into my life out of no where, and she was gone just like that !! I really want her back tho we live thousands of miles away !! as much as possible I am trying not to limit the Universe, yet, I am aware that we can totally manifest any specific person if we wanted to.